Being There – “So off to the mountains I went. There were at least two police roadblocks along the way, but I waved my press card and got through. Then I encountered the hippie roadblock, where my official press ID, duly issued by the Colorado Press Association, meant that even if I had a beard and was driving an old van, I was part of the evil establishment media that were exploiting and sensationalizing their innocent joyful celebration. But that festival had several sponsors, among them the Universal Life Church. I had first heard of it in 1969 when I read a magazine article about this bizarre California church that would ordain anybody. I wrote and asked if that was true. 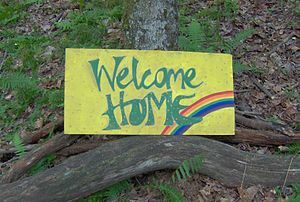 It was true; within days I received an ordination certificate and wallet card.” – Rainbow Recollections: Denver Post columnist Ed Quillen attended the first Rainbow Gathering.